spring Archives - GetGoing NC! 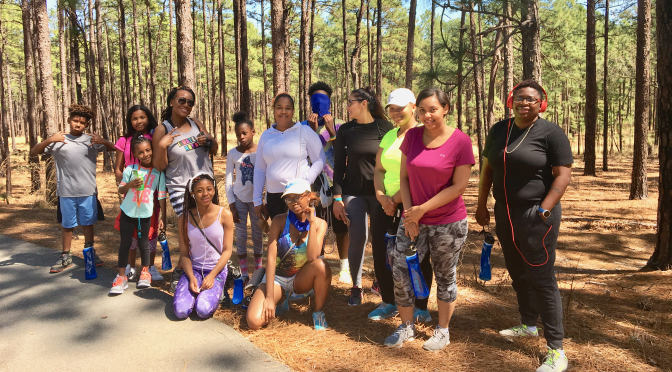 Hike NC, the hiking program launched in the fall of 2016 by BlueCross BlueShield of North Carolina, is back with 60 hikes this spring. This weekend, Earth Day weekend, the spring season kicks off with seven hikes. While many of those hikes are aimed at beginners — the goal of the program is to get more people moving and outdoors — there are several good reasons for more experienced hikers to check out those hikes as well. =&0=&. One in particular caught our eye: Saturday’s hike on the Sand Live Oak Trail at coastal Carolina Beach State Park. “It is our newest trail,” says park ranger Carla Edwards, who will lead the hike. This trail takes you deeper into the park’s community of ancient live oaks, sprawling evergreen trees that seem to extend forever. You’ll encounter a variety of other coastal plant communities as well, including the park’s rare carnivorous plant gatherings. 3.5 miles. =&1=&. Again this weekend, that includes Sunday’s 3-mile hike on the Bee Tree Trail at Pettigrew State Park. One of the state’s off-the-beaten-path gems, Pettigrew State Park is located south of Creswell, which is east of Plymouth, which — it’s on the way to the Outer Banks, off U.S. 64. Here, you’ll discover a rim of the massive old growth hardwoods that shielded Lake Phelps—at 16,000 acres the state’s second largest natural lake—from the prying eyes of early Europeans for years. You’ll find some of the oldest trees in the state here. =&2=&. You may hike a lot, but how well do you know the terrain through which you’ve hiked? 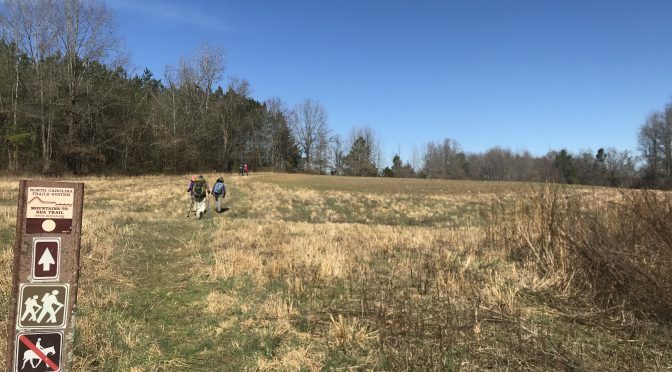 Several Hike NC hikes have an educational component: On Saturday’s Wildflower Hike at South Mountains State Park, Ranger Lance Huss will lead a 3/4-mile hike along the Jacob Fork River, identifying the many wildflowers now in bloom. And if you want to hike a little farther afterward, you can hike the 2.7-mile High Shoals Falls Loop and check out its 80-foot namesake waterfall. =&4=&. Are you in the habit of going to the same park and hiking the same trail? At Pilot Mountain State Park, for instance, folks drive lemming-like to the summit and hike the Ledge Spring Trail and other trails from the summit parking lot — even though on a brilliant spring weekend it can take a half hour just to find a parking spot. Well, your friends here at GetGoingNC and GetHiking! — did we mention that we are partners in Hike NC as well? — like the popular places, too, but we seek out the backdoor entrances. Saturday, we show you one of our favorite lesser-known entrances to Pilot Mountain. Where? You’ll have to visit the Hike NC website (details in a minute) to find out. =&5=&. On May 5, our friends with the Buncombe County Parks and Rec. 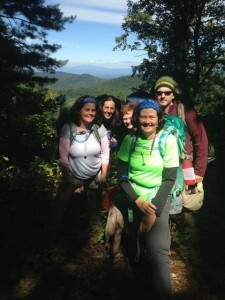 will lead a 6-mile hike on the Snowball Trail, high in the Craggy Mountains; on June 9, the same hike leaders will hike Sleepy Gap from the Walnut Cove Overlook on the Blue Ridge Parkway; and on May 6, we’re leading our favorite epic circuit in the Southeast: the 17.5-mile Doughton Park loop consisting of Cedar Ridge, Bluff Mountain and Grassy Gap Road trails. We’ll be adding some more challenging hikes over the next couple weeks. We love being a part of Hike NC, for all the above reasons. 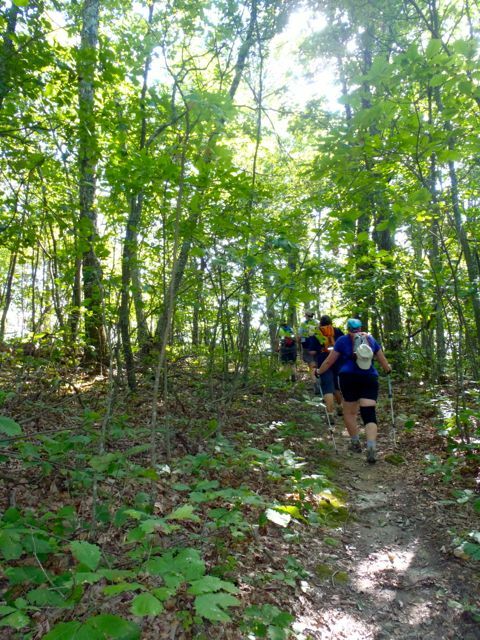 If you love hiking, you should love Hike NC, too. 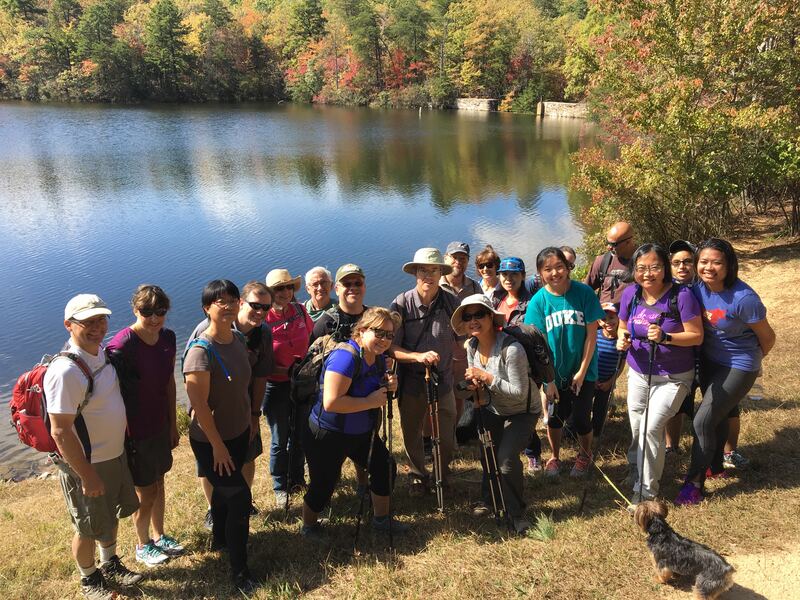 We’re going to be hiking at Little River Regional Park on the Durham/Orange line Saturday morning, then visiting Harris Lake County Park for a loop around the Peninsula Trail Sunday afternoon. After a week of temperatures nearing 80, the wildflowers should be in especially good form. If you’re looking for a hike home, we made a bunch of recommendations to our friends at BlueCross BlueShield of North Carolina. You can check out those here. Here’s a preview of what to expect if you head up to Little River this weekend — just add the sunshine! It started two weeks ago with a serenade by spring peepers in a pond at Horton Grove Nature Preserve. It was reinforced a day later by the sudden appearance of perky yellow daffodils near an old homestead along the Eno River. 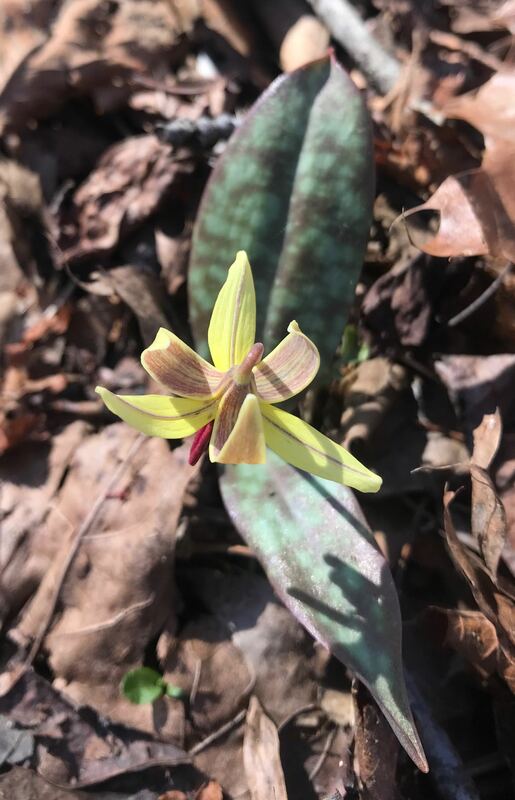 Then, last Friday, on a hike through bottomland forest at Ayr Mount in Hillsborough, I got the sign I’d been waiting for: a trout lily unfurling its delicate yellow and maroon petals. The first wildflower of spring. For some, the first sign of spring is when pitchers and catchers report to Florida. For others, it’s the closeout deals on winter wear at the mall. For me, it’s that first trout lily making its way through the leaf litter of the forest floor. Come these first signs of spring, folks arise from their winter slumber, eager to take on the trails they abandoned in November. Temperatures climb into the 60s and 70s, and the trout lilies are followed by fields of spring beauties and bluets. The oaks, tulip poplars and hickories fill the canopy with pastel pinks and yellows and reds. Everyone, it seems, wants to hike, and that’s great. But it also presents a challenge, starting with finding a place to park at the more popular trailheads. Come the first sunny, warm weekend of March, the two main parking lots at Umstead State Park in Raleigh — off Glenwood Avenue and Harrison Avenue — fill early; late arrivals park willy nilly where they can. Pilot Mountain State Park’s website includes an advisory that it can take up to 30 minutes to find a parking space. Crowders Mountain State Park has shuttle bus service from Gastonia. That’s not to say you can’t find solitude, even on the most gorgeous of spring days. At Umstead, for instance, the bike & bridle trailhead on the Glenwood Avenue side almost always has space, with access to Umstead’s best hiking, in the center of the park. The Pinnacle Hotel Access at Pilot Mountain usually has spaces, from which you can catch the Mountain Trail and climb to the summit via the Grindstone, Ledge Spring and Jomeoke trails. At Crowders Mountain, the remote Boulders Access feeds the Ridgeline Trail, from which you can take on a long romp into South Carolina. Or, follow in the footsteps of our GetHiking! hike leaders, who take into account the potential spring surge. We aim to start from these and other lesser-known trailheads, to get you out on the trails sooner and with less angst. The GetHiking! 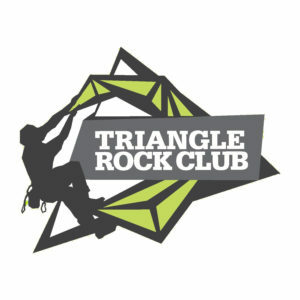 Triangle Spring Series begins March 11. We’ll hike every Sunday afternoon for eight weeks at a different location. For each hike, we offer a short (2-4 miles) and long (5-7 miles) version. The hikes in this series are designed to explore areas where spring wildflowers typically are blooming. In the GetHiking! Piedmont Explorer series, on the second Saturday of each month, we hike an area that may not be on your radar (but should be!). The hikes are 5 to 8 miles, start at noon, and last about three hours. Join us as we hike the trails less traveled. To find the GetHiking! hike nearest you, click on your local chapter.